I recently grabbed some of the new L.A. 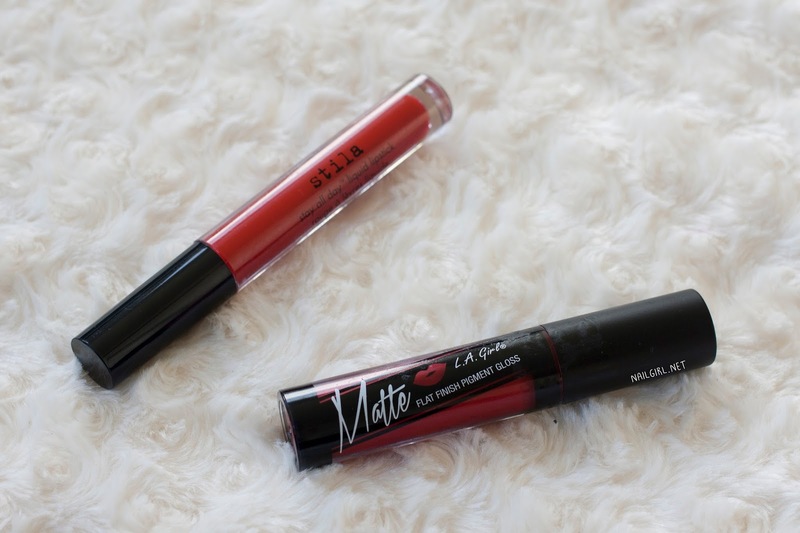 Girl Matte Glosses (review on the other colors soon! ), and one I'll focus on today is Frisky. Frisky wasn't a colour that I was initially drawn to - I only grabbed it after seeing it in real life at my local Unichem pharmacy for just $8.99*, and realising that it was actually a gorgeous, gorgeous red. I noticed it was pretty similar to my beloved Stila Stay All Day Liquid Lipstick in Beso and decided to compare the two. So are they dupes? Colour-wise, they are very, very close. Beso is just a touch brighter, but not by much. The first photo was taken using my Canon 1000D, and the second on my iPhone for comparison. In both photos, Frisky is on the left and Beso is on the left. 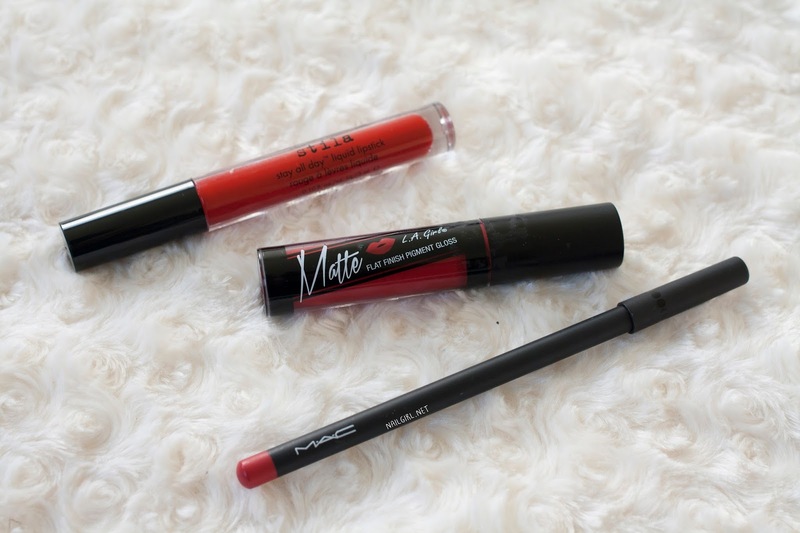 The third swatch is of my MAC Ruby Woo lip pencil, which I usually use to line and fill my lips before applying Beso. Now, on to comparisons about the formula. Frisky is one of the 'good' L.A. Girl mattes in the way that it applies evenly and opaquely, unlike some of the other colours in the same line (I'm looking at you, Backstage!). However, it's definitely much more drying on the lips than Beso, and is also much less forgiving when it comes to reapplication. The L.A. Girl mattes also have a tendency to peel, but again, Frisky doesn't suffer from that particular issue too badly. 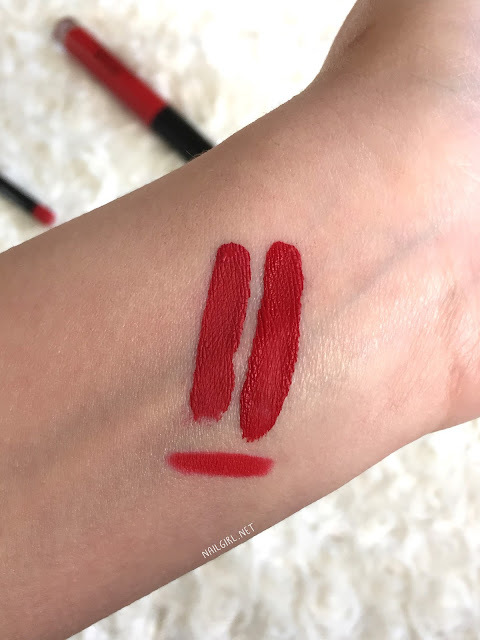 Frisky's formula is slightly thinner than Beso's formula, however I do think that it will gradually thicken slightly over time, something that I find happens with most of my liquid lipsticks. Unlike Beso, Frisky has no added scent. It doesn't really smell strongly of anything, but it would be nice if it smelled like cake batter like Beso does! Both of these are transfer proof on me, and only wear away on the innermost part of my mouth. However, that rarely happens as I eat food very carefully to minimise this. The biggest difference I found in overall wear was that Frisky bled slightly, especially around my upper lip line. 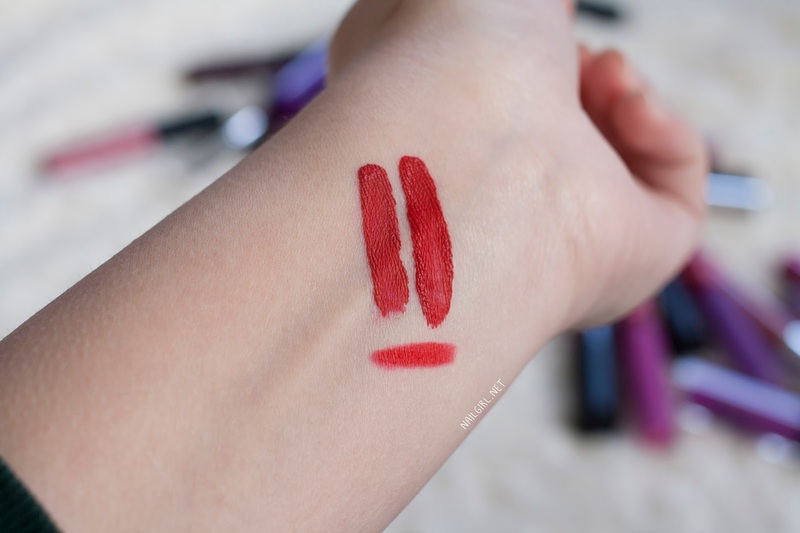 I this rarely happens to me, but I'm sure it could be fixed my using an invisible lip liner. Another significant difference to me is the length and shape of the applicators. I find that the L.A. Girl wand is a perfect length for application - the Stila wand is unwieldy in comparison. The Stila doefoot is very soft and flexible, which can make application a little tricky if you're not used to it, while the L.A. Girl doefoot has just enough firmness without feeling rough and cheap on the lips. However, the biggest difference between the two is the cost. Don't be fooled by Beso's longer tube - it only contains 3ml of product, while Frisky contains 0.17 oz, which converts to roughly 5ml! For Beso, the price per ml is $11.70 while Frisky only costs $1.80. My bottom line? 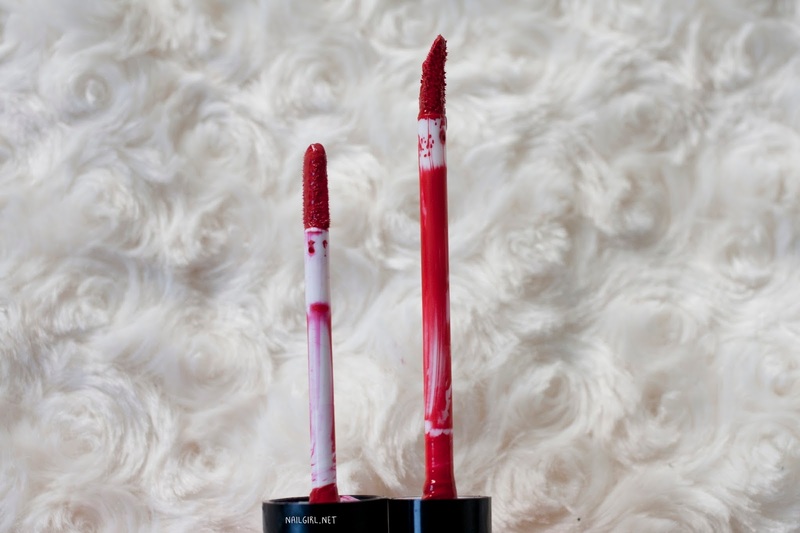 If you're just looking for a liquid lipstick in a gorgeous, classic red, grab Frisky. I would save Beso for when you really want to treat yourself!